In May 2012, then Vermont governor Peter Shumlin signed into law the state recognition of four of Vermont's Abenaki tribes: the Elnu, Nulhegan, Koasek and Missisquoi. The victory had more than symbolic significance: Formal recognition meant that many of Vermont's contemporary indigenous artists could begin legally to label their work as "American Indian." According to Elnu Abenaki member Vera Longtoe Sheehan, access to this designation has opened many new doors — including, at least indirectly, doors to galleries. Such fraught politics of visibility and authenticity are very much at the heart of "Alnobak: Wearing Our Heritage," now on view at the Amy E. Tarrant Gallery in Burlington. The show offers a chronological survey of Abenaki fashion and adornment, from the pre-Champlain era to the present day, accompanied by both modern and historical photographs. There's a twist, though: Almost all of the objects on view are contemporary, regardless of the era they were created to represent. While reproductions are often considered to be lesser facsimiles, in this case, the absence of "traditional" artifacts speaks to the 20-plus artists' ongoing commitment to making their history and heritage come alive. "Being in a mainstream art gallery is such a huge step forward for us," said Longtoe Sheehan during a gallery visit. In the context of the show, "Alnobak" roughly translates as the people of N'dakinna, a region encompassing Vermont, New Hampshire and parts of Massachusetts, Maine, New York and Québec. "This is a celebration of thousands of years of our history and culture," Longtoe Sheehan continued, "the resilience of our people, the resistance of our people." The exhibition evolved from a decade-long collaboration of local Abenaki and the Vermont Abenaki Artists Association, of which Longtoe Sheehan is director, and with the Lake Champlain Maritime Museum, where Eloise Beil is director of collections and exhibitions. The two have been at work curating this particular show for three or four years, they estimate. Longtoe Sheehan noted that the exhibition pointedly includes some artists who have not been able to obtain government recognition. "They're Abenaki, [too]," she said. Arranged in a U-shape following the gallery walls, the show begins with an archaic-style knotted bag by Longtoe Sheehan. Made from plant fibers, it features a design motif called "where the mountains meet the sky" in richly dyed hues of blue and yellow. 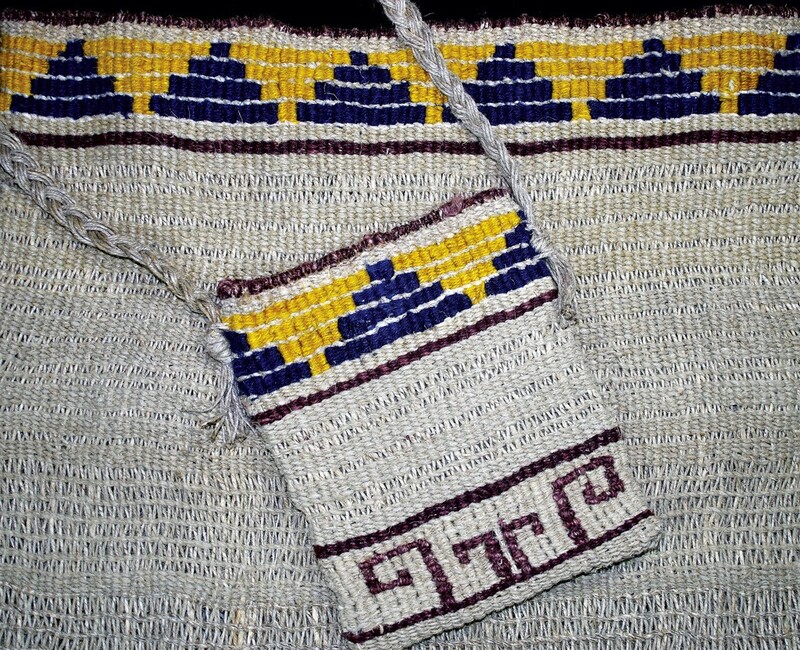 Longtoe Sheehan learned knotting — a weaving technique often referred to as "twining" — from her father when she was growing up. Close by is a 1600s-style buckskin dress made and worn by Melody Walker Brook. It's designed after drawings by Samuel de Champlain, who first came to the region in 1609. 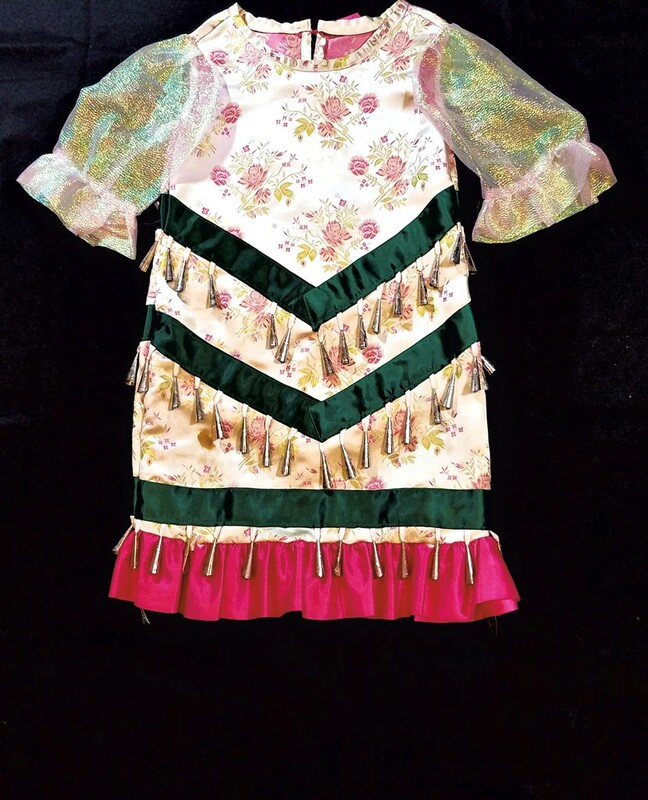 The dress is one of many garments created as part of a practice called "experimental archaeology," in which living Abenaki re-create and test the styles of their ancestors at "living encampments." Next comes a series of objects that exemplify the early days of Abenaki adaptation to European presence. Beil finds it important to counter the "impression that Native American presence ended when the European presence began." She pointed out, "The indigenous never left — other people came and co-occupied the space." To this end, Beil and Longtoe Sheehan have created study guides for young students that, they say, "come with a decolonized voice." Items representing these first centuries of "contact" include original trade beads made in the Netherlands and Venice, as well as works by Janice Medor, Jim Taylor, Paul-Rene Tamburro, Francine Poitras-Jones, Rhonda Besaw, Lori Lambert and Denise Pouliot. Taylor's delicate roach (a traditional type of headwear) looks like abstract sculpture, crafted with porcupine quills, vibrant red deer hair and brass "kettle cones," a popular trade good of the 17th and 18th centuries. Poitras-Jones' acrylic "18th Century Abenaki Couple" interprets a 1700s watercolor by an unknown artist and depicts the hybrid fashions of the era's Abenaki. The artist constructed her own frame from birch branches and leather. Medor's women's garments, titled "Traditional With a Twist," feature delicately embroidered flowers on purple gingham, one of the cotton fabrics traded by Europeans. Thick ceremonial wool coats by Besaw and Pouliot are artfully embellished in beads and chain stitches, respectively, with Abenaki symbols including pine trees, tobacco leaves and variations on what Longtoe Sheehan calls the "double curve." Such designs are found throughout the exhibition; indeed, the curator said she was astounded by their continuity. A wealth of archival photos of Abenaki hang on what Longtoe Sheehan referred to as the "Wall of Honor." Among them are a portrait of 19th-century matriarch Nellie Longtoe Sheehan wearing an animal claw beside her crucifix pendant, a post-1950s picture of Huntington resident Leon Bridges standing in front of his woodpile wearing full regalia, and a photo from the wedding ceremony of Bob and Jeanne Morningstar Kent. The final gallery wall is reserved for works that decidedly merge contemporary indigenous and Western styles. There's an early 1990s denim jacket that Longtoe Sheehan embellished with small quahog shells and a turtle design on leather, along with hair ties and earrings that Liz Charlebois crafted using the nearly lost technique of birch-bark biting — which is exactly what it sounds like. Pat Leno made a beaded stone necklace as a tribute to her friend Lara Sobel, the social worker who was murdered in Barre in 2015. Perhaps the most eye-catching works here are the neon dancing outfits of Takara Matthews, which Longtoe Sheehan described as inspired in part by the loudness of urban graffiti. 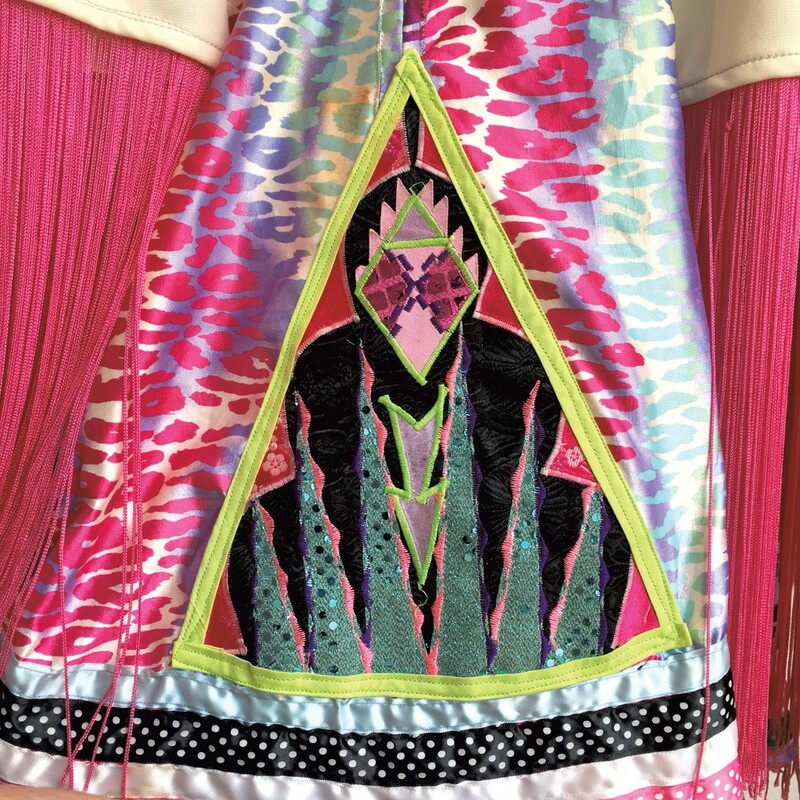 Matthews created the "Little Girl's Jingle Dress" and "Girl's Fancy Dancing Dress" for her daughter Nami — who "danced until her cones fell off," Longtoe Sheehan said, pointing to a missing bead. Between the costumes hangs a stethoscope with an intricately beaded casing, made and used by EMT Aaron York. "We can't separate our spirituality from our history from our art," said Longtoe Sheehan. "The very being of our art is a celebration of our culture." Both she and Beil are excited and moved, they said, that members of the Abenaki community have been coming to the exhibition with their parents and grandparents, many of whom grew up hiding their indigenous identities. There's a lot to be learned here, and the door is open. The original print version of this article was headlined "Tribal Pride"